In a city that’s packed to the gills with so many good restaurants, it takes a canny restaurateur to spot a gap in New York’s heaving dining scene. 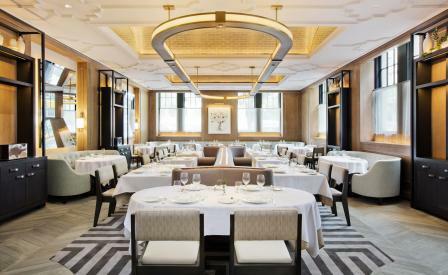 But Michael White and his Altamarea Group business partner Ahmass Fakahany had long felt there was room for a (slightly) casual French restaurant that was neither a stuffy formal space nor the ubiquitous bistro. Which is where Vaucluse comes in. Designed by local firm Meyer Davis, the light airy dining room, a couple of blocks from Central Park and fortuitously within spitting distance of the Alliance Francaise, is a delight – its barreled vaulted ceiling lined in gold subway tiles shimmering over a graphic carpet, low slung tufted banquettes, and a cheery oil painting by Alexandria Tarver. The inspiration, Meyer Davis says, is of a centuries-old chateau after a modern refurbishment. Following six very successful Italian restaurants, this is White’s first foray into French cooking and he has handed the kitchen reins to Marea alum Jared Gadbaw. On the menu are the usual suspects of a French table, but tarted up with fresh flavours and unexpected ingredients – so, for instance, the classic escargots are paired with red carmague rice and feta, duck liver terrine with a grape confiture, and roast chicken with preserved lemon jus. C’est bon.